Heat Units : 16 millon SHU [ scoville heat units ] THE hottest Possible !!!! 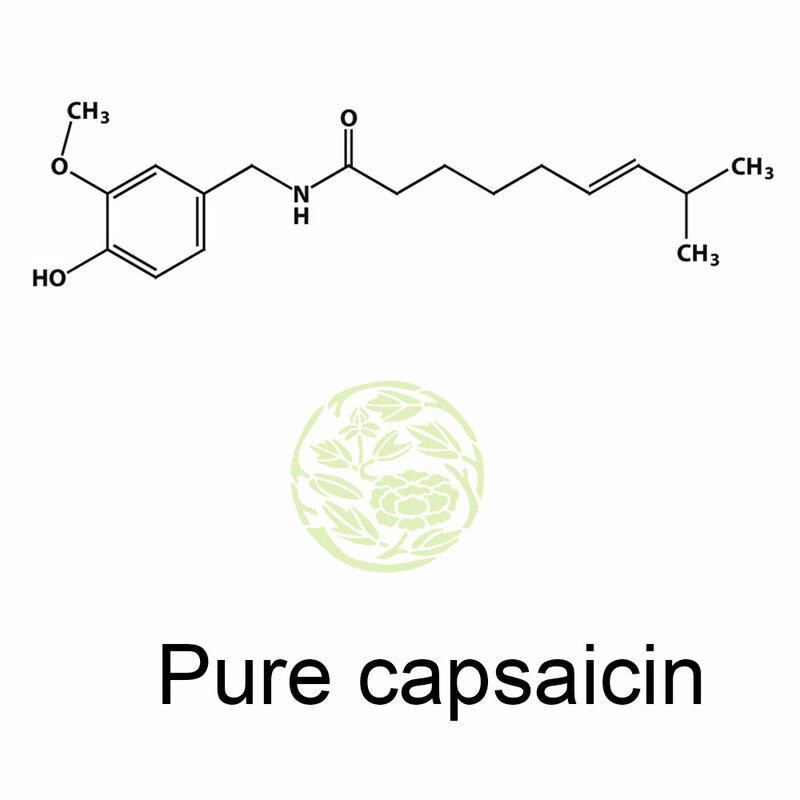 Pure Capsaicin is the extract of one of the hottest peppers in the world. Chilli is a fruit from plants which belong to genus Solanaceae. Its first registered use was in the US in 1962. When it is refined it becomes a reddish brown liquid and is called oleoresin. It is also considered as a biochemical pesticide. It piquancy is 15 to 16 million that using it can be fatal at times. On a lighter note we see people trying to create records by consuming Pure Capsaicin. 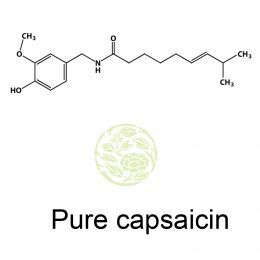 It is very dangerous to consume pure capsaicin but human nature is to face challenges for the kick of it. Capsaicin as a natural chemical is used in medicinal products. This chemical is used as the basic chemical to test the piquancy of a chilli and is the main compound tested in Scoville Scale test. U.S. Grade Pepper spray is known by other names like OC Gas, OC Spray and capsicum spray. It ranks second in the Scoville Heat Units table with 2 to 5 million heat units. This is found in the fruits of plants of Capsicum genus. The main ingredient is capsaicin and for this the pepper is ground to a fine powder. It causes tears and pain in the eye as it irritates the eye. It can cause temporary blindness at times. Though not a fatal variety of pepper it can cause major damage and death in rare cases. Realising its potential its solution is used in riot control and other policing acts. It is used as defence against dogs and bears. Pepper spray is also synthetically created and it is this that is widely used in defending from assailants. In some countries it is considered illegal to use US Grade Pepper Spray. Next in the table is BhutJolokia with 1 million Scoville heat units. It is cultivated in Nagaland and Assam in India. When translated into English it is Ghost pepper. Though it is seen in abundance in eastern states of India it did not originate here. Till about 2007 BhutJolokia was considered as the hottest edible pepper but now studies have pushed it to the second place as Trinidad Moruga Scorpion supersedes it. It is considered as the king of chilli, mirchi, in India. A little of this added to food makes it extremely spicy. The Indian variety of BhutJolokia has varying plant size and fruit size. Amongst all the peppers this pepper has a unique shape and the skin is very thin. It is said to be unique because the skin is dented unlike other pepper which has smooth skin. The plants of rough fruits are taller and have fragile branches and yields lesser than the smooth skin plants. The Red Savina Pepper follows BhutJolokia but the heat unit is very low compared to the first three on the table. It has 5 to 6 laks of Scoville Heat Units. It is mostly grown and available in the US. In Guyana, it more commonly known as, the Ball of Fire Pepper or Dominican Devil's Tongue Pepper. The US has declared a protection status to this pepper. Habanero Pepper is the parent of Red Savina Pepper. Habanero was bred selectively to create larger, heavier and hotter pepper. Frank Garcia of GNS Spices was the one who developed Red Savina Pepper from Habanero. From 1994 to 2007 Red Savina Pepper ranked first for its spiciness but in 2007 it was replaced by BhutJolokia. While handling this chilli pepper gloves are recommended even though the heat units are much lesser. The skin of this pepper also has many dents and is smaller when compared to other chilli. The Habanero pepper which has a Scoville heat unit from 20 laks to 35 laks is seen in the Amazon region. It is also seen in Mexico. It comes in various colours like green, red, brown and pink. A fully ripened Habanero pepper will grow to a size of 2 to 6 cms. Although this pepper thrives in hot weather it is plant that flower perennially. In temperate climates it is treated as an annual plant. This was domesticated many thousands of years as found out by archaeologists. Today it is an important ingredient part of the Yucatecancusine as Yucatan is the largest producer of Habanero pepper. Though Mexico is the hub for this pepper, its aroma and flavour is becoming a favourite with people all over the world. The exotic version of this pepper is the black habanero. It is spicier than the regular one and has an extraordinary flavour. The Caribbean Red also belongs to this family but there is a slight variance. Following Habanero is Chiltepin pepper which has many names like chiltepe, bird pepper, turkey and some more. This is because the birds consume this pepper and are greatly responsible for seed dispersal. This pepper is very small but extremely spicy and measure between 10 laks to 25 laks on the Scoville Scale. It is considered quite hot. The shape of the pepper is episodical and the fruit takes on a red or an orange-red hue. It is a native pepper of Northern America and northern part of Southern America. It grows well on loamy soil or soil that has silt. So Puerto Rico also has a rich cultivation of Chiltepin Pepper. In forest areas where there is a clearing or is uncovered this variety of pepper grow. In Arizona however it needs a shade to grow. In 1997, in Texas it was the official native pepper but was soon replaced by jalapeno. Cayenne Pepper is the most widely used pepper and its heat units range from 30,000 to 50,000 units. Asian countries use this pepper generously. It is also known as aleva bird, Guinea Spice and cow-horn pepper. When young or ripe it looks green. Sometimes it turns red when it ripens. It is eaten as it is or sometimes it is powdered and made into flakes and added as a spice in the dishes. It is grows perennially in the tropical and sub-tropical regions. For the plant to be a full grown plant one must wait for 100 days and the plants grows to height of 4 ft. Keeping the plants at 1 ft space and on a raised bed will improve the yield per unit area. Cayenne pepper is one of those rare peppers which provide a lot of nutrients along with flavouring food. It is good for health as it improves the circulation of blood. Arbol is a beak like pepper which is very potent in piquancy. It is also known as rat's tail chilli or bird's beak chilli. It is also known as Chile De Arbol. This name comes because of its woody stems appended to the pod. It means 'tree like'. It is only 2 to 3 inches long and has a diameter ranging from ¼ to 3/8 inches. However on the Scoville scale it measures 15,000 to 30,000 heat units. So though small it is highly potent. It is consumed fresh or dried or powdered. When mature the peppers are bright red in colour. It does not lose its colour even after dehydration, therefore is sometimes used on wreaths. In cuisines it is sometimes used instead of cayenne pepper. Cayenne pepper or pequin pepper can be used instead of Arbol pepper when it comes to cooking. It is believed to have been derived from cayenne pepper. Manzano looks like what the layman calls capsicum but not a capsicum annum species. This is quite rare for chillies cultivated in Mexico. Its origin is from the Andes region and belongs to the capsicum pubescence species. It only looks because its piquancy is quite high while capsicum has a reading of zero heat units. It comes from the famlily of South American rocoto which is hot and spicy. It is a unique kind of pepper as it has black seeds. Its skin is thick and therefore has to be consumed fresh as it is difficult to dry the skin of Manzano. The word manzano is translated as apple and it has other names like Chile Ciruelo, Chile Peron and Chile Caballo. On the Scoville scale its heat units range from 12,000 to 30,000. When it ripens, it turns into a yellow orange colour. It is the favourite chilli ingredient for preparing hot salsas. Like most of the species of pepper Serrano is also grown in Mexico. It originated in the mountain areas of Hidalgo and Puebla, two states in Mexico. The name also refers to the mountains as 'sierras' means mountains. The full grown Serrano pepper plant grows to a height of five feet, which is the maximum growth. The minimum height is one and a half feet. From one plant you can get around fifty pepper pods. The seeds of the green or the ripe fruit can be used for harvesting. It can be harvested when ripe or unripe. When the fruit is unripe it is green in colour and takes on many colours like red, yellow, brown, orange and green when ripe. Serranos cannot survive in places there is frost. It needs warm temperature to grow to its full potential.This follows manzano in the heat units in the Scoville scale. Its heat units range from 8000 to 23,000. Yellow Hot gets its name from the colour of the chilli. It is also known as Hungarian wax chilli. It is very spicy to medium spicy and on the Scoville scale its heat units ranges from 5000 t0 8000 heat units. It is served in salads, used in salas and as a pickled appetizer. Jalapeno has its origin in Mexico mostly found in the river basin of Papaloapan which is northern side of Veracruz. It is consumed while it is green and sometimes it is allowed to ripen. When it ripens it turns into a crimson red colour. Its heat units on the Scoville Heat units are 3500 to 8000. The juice of jalapeno is used for curing seasonal allergies and for cardio vascular problems. It grows to about 2 – 3 ½ inches and is picked while it raw. It takes about 70 to 80 days to grow and the full grown plant stands three feet tall. Jalapeno pepper has a Spanish origin. It is named after a town in Mexico called Xalapa. The plant takes 70 to 80 days of growing and when it is fully grown it stands to a height of two and half to three feet. The plant turns out 25 to 35 pods. It can be picked many times. When its life span is over it turns red and then it does not taste good. While green the skin has a similar flavour of bell pepper. Jalapenos thrive in any climate and any kind of soil. The only requirement is enough water. The pepper is picked and eaten green or ripe. 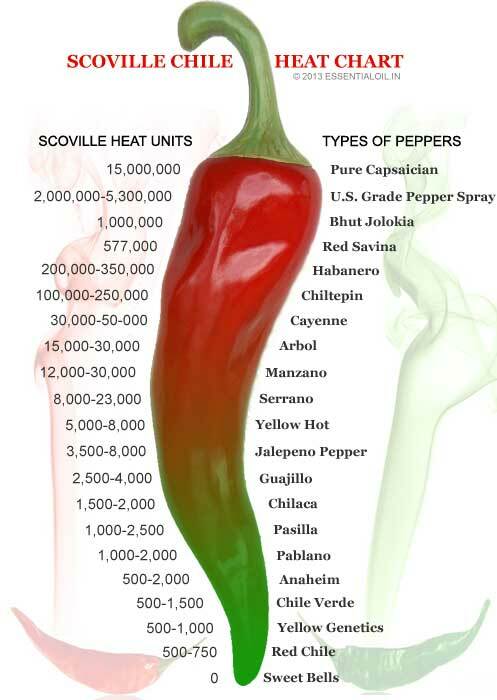 On the Scoville sacle it ranges from 3500 to 8000 heat units. Capsaicin is found near the membrane around the seeds. So handling it can cause irritation and it is generally done by wearing gloves. Take special care of the eyes as contact with this pepper can cause intense burning. As we go down the Scoville scale we come across Guajillo used in the Spanish and Mexican cuisine. It is used dry or after dehydration. The skin of this pepper is very thin and the flesh has flavours of berry and green tea. As a fruit it is has only mildly piquant. On the Scoville scale it ranges from 2500 to 4000 heat units. When dried it is a little spicier. The fruit is dried and then soaked. Soaking makes it easier to pulverize and then it is made into a paste which is used in preparing various dishes. The pasted is prepared with salt and few other ingredients. The end result is a thick, flavored red sauce. In the salsa made for tamales this pepper is used. Cooking experts says a powdered version of the Guajillo pepper is also a great way of using this pepper in cooking as it is easier to add. A thin, curved or twisted pepper which does not rate too high on the Scoville scale is Chilaca. When this pepper is dried it is called Pasilla pepper. It becomes dark green or dark brown when it ripens. It is a narrow variety of pepper which grows up to a length of 9 inches. It belongs to capsicum annum variety. It is found fresh in USA, especially in the farmer's market and sometimes in the grocery store. Its heat units range from 1500 to 2500. Since it is not too spicy most cuisines use this chilly. Pasilla pepper is considered as separate pepper even though it is a powdered form of Chilaca. This powdered pepper goes very well with fruits and gives a delicious taste when served with lamb, seafood and duck. Oregano, honey, garlic and fennel also are a good combination with pasilla pepper. Its Scoville scale is 1000 to 2500 heat units. Poblano is a pepper with heat units 1000 to 2000 heat units. This is one of the mildest varieties of pepper which grows all over the world but has its origin in Mexico. When dried it is called chileancho. It is short and fat kind of pepper. If you want a dash of pepper into your cuisine then you can use this pepper without making the dish very hot. The ripened poblano turns red and is spicier than the green one. It has been seen that some chillies are hotter than others indicating a variance in the heat in the pepper. The plant is a multi-stemmed branch reaching to a height of 25 inches. The pepper fruit grows 3 to 6 inches long and 2 to 3 inches wide. It grows in countries where there is plenty of sunlight. In Mexico it is very special as it is used in the Mexican independence festivities. With heat units of 500 to 2500 on the Scoville scale is the Anaheim pepper. Once again this is mostly found in Mexico. It is also known as California Chilli and Magdalena and since it originated in New Mexico it is also known as New Mexico peppers. From New Mexico it was brought to Anaheim in California. The ones in New Mexico are hotter than the ones grown in California. Chille Verde measures 500 t0 1500 heat units on the Scoville Scale. As the scale indicates it is not at all spicy and can be used liberally. It is used in Mexican cuisines and the chillies are mostly roasted and cooked with meat. It combines well with cumin, oregano and garlic. A green chilli stew is made with this pepper. It is also used in various other dishes and it is used as a condiment. An ideal pepper to spice up dishes made for children. Chilli Verde is an extremely spicy sauce that is Mexican- American. Chilli con carne is the most popular version and is served in New Mexico, New Arizona and in the southwest United States. This spiciness is derived from mixing pablano, habnero Serrano and jalapeno. This sauce is used to cook pork and chicken. The vegetarians eat this sauce with pinto beans. In this dish garlic is also used and all the chillies mentioned above are roasted. The chilli is roasted with pork or chicken and cumin, oregano and garlic. Tomatoes are hardly used in this sauce. It is also known as green stew which is a thinner version of chilli con carne. It is also served as a condiment with hamburgers and fried eggs. Since it is a popular dish in Mexico and United States it is included into the Scoville Scale and has a heat unit ranging from 500 to 1500. Yellow Genetics is a genetically created pepper from Arizona. It is green to yellow in colour and becomes orange when it ripens. It was created for its mild flavour and fleshy texture. It is more than 25 years that Ed Curry, a farmer and his partner Phil Villa, a chilli breeder have been working towards a hybrid variety in pepper. They wanted chilli pepper that was not potentially piquant but spicy enough to be used liberally in dishes. It is a truly hybrid variety and the breeders are trying to bring about a uniform variety. 80 to 90 percent of Yellow Genetics is grown in the US and a large chunk of this comes from the farms in Arizona. Their research and breeding has improved the yield of this chilli as well. The heat level of this pepper is 500 to 1000 heat units on the Scoville scale, therefore not very spicy. Red Chilli is also known as chilli pepper and ranks the lowest on the Scoville scale. Its heat units range from 500 to 750. Though it originated in America it was brought to Asia by the Portuguese navigators. In America it was known to be used since 7500 BC. Christopher Columbus was one of the earliest European to spot it and called it pepper. The word chilli came on later. As the chilli travelled the name also traveled and it is known as chilli in most part of the world. The pepper has been dropped. Today India is the largest consumer and exporter of red chilli. It is used in food and medicines. India is a land which has a variety of cuisines and the red chilli is one of the favorite ingredients. Since it was Portuguese who brought it to India, Goa, which was a Portuguese settlement, uses this pepper the most. Sweet bells do belong to the pepper family but they are not at all spicy and its heat unit is 0 in the Scoville scale. Many colours of sweet bells are available in the market like green, yellow, orange, red, purple brown, white. It originated in Mexico and Central America but is now cultivated in all parts of the world. China is largest producer of sweet bells. To grow sweet bells you need a warm soil that has to be kept moist but not water logged. Excessive temperatures and excessive water will damage the plant. It is also known as sweet pepper and in India it is known as Capsicum to the common man. It is served as it is in salads. It has a nice flavour and can be used as ingredient in dishes. Sweet bells have its share of nutritive value. It is rich in Vitamin C and has anti-oxidants.